This topic contains 4 replies, has 2 voices, and was last updated by Jason Earrame 11 months, 3 weeks ago. I must be missing something. I don’t understand how to make the PDF that I upload to work with in the field map designer. Is there a template? I have the formidable form made already and I need to make it possible for the user to print the completed form. The PDF you upload to the plugin MUST be already contain the PDF form fields. Our demo video shows how the field map layout is created. NOTE: It’s best of you copy/paste the names of the Formidable form fields to the PDF form fields, and check the “Enable automated layout creation for new field maps” option on the Settings tab prior to creating the Field Map Layout, that way the plugin will automatically create the field map layout (except for checkbox fields and repeatable sections). So I use adobe acrobat to create a PDF form that contains all of the fields? Yes, Acrobat or any other Acrobat compatible PDF form creator. 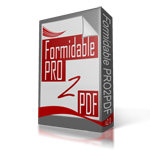 We have release a replacement plugin called E2Pdf which includes a PDF form designer. As of today, the plugin is in beta testing, but it’s working well.